While the main opposition Liberty Korea Party continues to suffer from low approval ratings and factional conflicts, the party is discussing the adoption of a resolution demanding that two of the nation’s former presidents be freed from detention as they await their appeal trials, having already been convicted on various corruption charges. The lawmakers of the conservative party are broadly divided between those “loyal to” ousted former President Park Geun-hye after her impeachment and her opponents, causing dissonance within the beleaguered party. The adoption of the resolution is seen as an attempt to strengthen solidarity among its members. On Nov. 29, veteran lawmakers from the two factions met to discuss ways to overcome the factional differences and to consolidate the party. Five-term lawmaker Rep. Kim Moo-sung and three-term lawmaker Kweon Seong-dong came to speak on behalf of the anti-Park members, while four-term lawmaker Rep. Hong Moon-jong and three-term lawmaker Rep. Yoon Sang-hyun represented the pro-Park members. 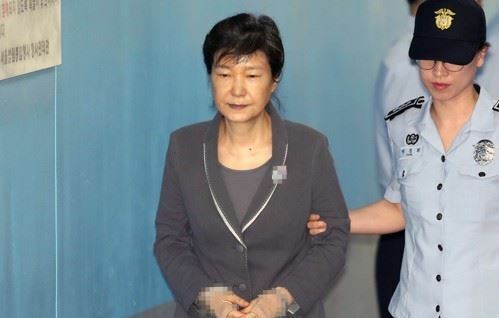 All four conservative lawmakers agreed on the need to call for the release of the two former presidents -- Park and Lee Myung-bak -- while they appeal their convictions. But the two factions could not reconcile their differences over Park, who was impeached by the National Assembly in 2016 over a massive power abuse case. Rep. Hong reportedly demanded an apology from the anti-Park lawmakers for supporting the impeachment and creating rifts within the conservative party, but the pro-Park lawmakers refused.